If you had to describe larger-than-life Microsoft CEO Steve Ballmer, he of the Monkey Dance and "Developers! Developers! Developers! ", in a single word it wouldn't be "retiring" - but he is, in news that we suspect surprised him as much as it surprised the rest of us. The official date hasn't been announced yet, but Steve Ballmer will step down within the next 12 months. "I think you'd be hard pushed to find someone in the tech world who felt that Steve Ballmer was the best man to make Microsoft great again," says UK editor in chief Patrick Goss, but "Microsoft is still jam-packed with talent and innovators, it's cash-rich and one of the most trusted brands in the world." Forbes famously dubbed him the world's worst CEO last year, but that's unfair: under Ballmer, Microsoft has made astonishing amounts of money. The consumer division may have taken a few knocks, but the enterprise division is enormously successful - as Mary Branscombe elaborates in a feature on Ballmer's triumphs. Did he fall or was he pushed? The smart money's on the latter, with many analysts expecting Microsoft's next financial results to be horrific - largely due to disappointing sales of Windows 8, which Ben Stinson says should have been touch-only from day one, and disastrous sales of Windows RT. So who's next for the top job? Patrick Goss's list of potential candidates contains more than a few surprises. The other big news this week was that the UK's 4G networks, which are only currently available to one very tall woman in central London, will finally be rolled out to, ooh, at least seventeen people. Only kidding: 4G's about to go wheeeeee, because O2 and Vodafone have finally joined the 4G party. As John McCann reports, it's not all good news: "O2 is initially launching its LTE service in just three cities to start with - London, Leeds and Bradford - while Vodafone is being even more conservative by starting its service off in the capital only." Their rollouts aim to reach a whopping 13 cities each before the end of the year, which means they'll be quite far behind EE: it hit the 100-town, 60% of the population milestone this week. Also trailing is Three, which doesn't turn on its own 4G service until December. That might be worth waiting for, though: the network promises that it won't charge customers any extra for 4G mobile broadband. To find out which 4G network is best, check out our updated guide. You can't use the new Nexus 7 on 4G yet - it's only shipping in 16GB and 32GB Wi-Fi versions for the time being, although an LTE version is coming - but that's unlikely to stop it from selling squillions. As Phil Lavelle reports in his Nexus 7 review, "this is one beautiful piece of equipment... Google has taken what made the original such a belter, corrected almost every niggle with it, bumped the price up ever so slightly yet also made the Nexus 7 feel so much more premium." It isn't perfect, but "if you're looking for a 7-inch tablet... there is no better alternative on the market right now." Have you ever looked at Nintendo's 3DS and thought, "wouldn't it be great if it didn't fold, looked really odd and didn't have 3D"? Then have we got news for you: Nintendo's unveiled exactly that in the form of its new, cheap 2DS. As Matt Swider says, "like every Nintendo product launch in recent years, the 2DS is mired by some strange design choices... different, but no better than the old one." 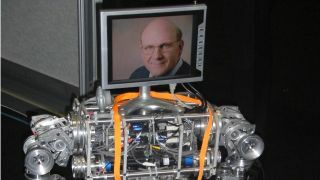 TechRadar analysis: Ballmer leaves Microsoft, but in what shape?